Video clip synopsis – Technology has revolutionised the nature of 'guerrilla filmmaking'. Broadband MP4 worldrace_bb.mp4 (15.3MB), suitable for iPods and computer downloads. 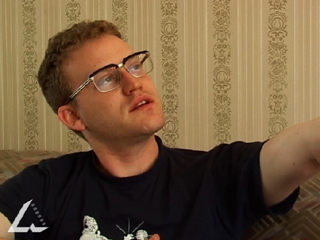 This interview with John Safran was recorded for the website From Wireless to Web, produced in 2005. In 1995 Panasonic, Sony, Sharp and JVC all launched the first digital video camcorders. LCD displays replaced viewfinders – in fact, today’s camcorders are little more than an LCD with a lens assembly attached. Miniaturisation, plus digital recording and editing, have consolidated the place of 'guerilla’ recording for Internet and television broadcast. During the 1990s, the Internet took off with the advent of the World Wide Web. Advances in information and communication technologies (ICTs), plus the rollout of high-speed broadband access have ensured a powerful role for the Internet in the post-broadcast era. Starting in 1989, Avid pioneered computerised or digital non-linear editing, which has radically changed production for film and television. Linear editing goes back to the days of silent film, but the traditional process of sequentially spooling shots from reels of film has almost vanished. Before NLE, an editor sat with a number of videotape recorders, each connected to a monitor – two source decks and an 'assemble’ or record deck. With NLE, the video editor sits in front of a computer and the digitised source material and assembly all occur on the computer screen. Instead of reels of tape, editors rely on powerful, high-speed hard drives. How has technology made filmmaking more accessible? What do you think John Safran means by ‘guerrilla’ filmmaking? With digital editing and special effects do you think there is a tendency to concentrate on these rather than on the content? Some people say that there is often too much emphasis on how a film is made rather than on what is being made.